On a lighter note, Qatar’s unexpected winning of the Asian (football) Cup and the 2022 FIFA World Cup was mentioned at the conference in the context of the State’s ongoing commitment to the sector as a means of bringing people together through sport. 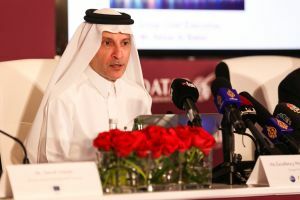 The Qatar Airways chief executive has endured arguably the toughest period of any airline chief in recent times. On what he described as an "evil day” on 5 June 2017, Qatari-registered aircraft were banned from overflying the airspace of Bahrain, Egypt, Saudi Arabia and the United Arab Emirates, amid a regional political dispute. This impasse forced a rapid network restructure, the suspension of services to 18 destinations and lengthy flight re-routings, particularly those to Africa. The cargo side of Qatar's business, however, has flourished, as the airline initially served as an "air bridge" to supply the country's domestic needs. Passenger numbers fell dramatically with prime routes banned. In the airline's latest full financial year, to 31 March 2018, it suffered an 8.9% drop in carryings to 29.2m. This compares with just over 32m in the previous 12 months and followed years of consistent double-digit growth. Announced in September, the results saw a group pre-tax loss of QR156m ($43m) – figures that Al Baker says were considerably better than early estimates. "We lost 20% of our capacity and nearly 13% of our network. This was a big shock. But we found new markets. When you now compare June, July and August, we have grown 11% year on year compared with the first three months of the blockade," he said. “Qatar Airways has demonstrated tremendous resilience in the face of the blockade, and our strength as an airline is reflective of that of the State of Qatar as a whole. Rather than falling to our knees, we have transformed the blockade into an opportunity to innovate and diversify. One of our key objectives is to ensure a regulatory environment that encourages investment and welcomes new entrants into the market. We strongly believe in the vital role that liberalised aviation plays in connecting people and fostering economic prosperity. “While my country may be small in size, we are big in ambition. This is why we have set ourselves the goal of becoming the first country in the Gulf region to achieve a Comprehensive Air Transport Agreement with the European Union. We expect that this agreement will demonstrate to the world that through positive engagement, we can build trust among nations, overcoming the fear of competition and embracing the benefits of liberalisation. Al Baker reminded the audience that in spite of the provocation Qatar Airways was named ‘World’s Best Business Class’ in the 2018 World Airline Awards, managed by Skytrax. It was also named ‘Best Business Class Seat’, ‘Best Airline in the Middle East’, and ‘World’s Best First Class Airline Lounge’. In recent months, it has launched an array of exciting new destinations, including Gothenburg (Sweden); Mombasa (Kenya) and Da Nang (Vietnam). The airline will add a number of new destinations to its extensive route network in 2019, including Malta, as well as many more. In a speech covering the essentials of air transport, IATA director general Alexandre de Juniac endorsed Al Baker’s comments. 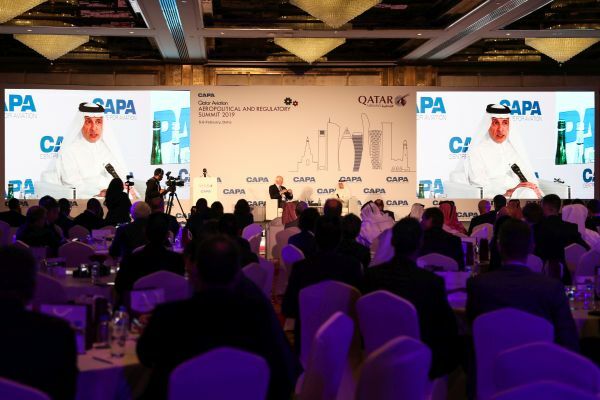 European Commission director general mobility and transport Henrik Hololei said Qatar was a powerful example for aviation as a driver of transformation of an entire economy. “The blockade of Qatar and blockade of transit route was unthinkable to most of us. This was 19 months ago and unfortunately nothing much has changed. The only thing is that Qatar has shown its resilience which we all admire,” he said. “It is essential to defend the integrity of the Chicago Convention to ensure the international framework for civil aviation is respected and that safety of flights is never put into question. We also cannot tolerate using civil aviation for striving regional and political aims; this is and remains Europe’s position,” said Hololei. The conference attracted key international industry speakers including RwandAir chief executive officer, Yvonne Manzi Makolo; African Airlines Association (AFRAA) secretary general Abderahmane Berthe; Arab Air Carriers Organisation (AACO) secretary general Abdul Wahab Teffaha; lnternational Air Cargo Association (TIACA) secretary general Vladimir Zubkov; Malaysian Aviation Commission (MAVCOM); director of aviation development Germal Singh Khera; FedEx Express senior vice-president and general counsel Rush O’Keefe, and JetBlue Airways senior vice-president government affairs and general counsel Robert Land.